11 Apr 2011 - Auntie Annie's, Belfast. We were pleased to be asked to do a gig for EQ Promotions, at Auntie Annie’s in Belfast. 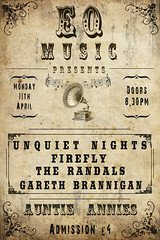 Also playing were Gareth Brannigan, The Randals & Firefly. Read more about it in the April 2011 blog.